Analysis: Russian GP to continue trend of recent races? Big weekend for Williams? This weekend's fourth round of the F1 World Championship at Sochi is likely to be a fast and furious affair with the teams defaulting to the softest tyres in the range on the low-grip surface. While this will suit teams like Ferrari and Haas, who have had success with aggressive strategies so far, it will mean a change of philosophy for Williams, that has defaulted to the medium tyre at several races, to their cost. We are unlikely to see much running on the medium in the race as it is much slower than the soft and supersoft compounds. This is an important weekend for Williams. The team has performed very strongly at Sochi the last two seasons, with Valtteri Bottas qualifying in the top three on both occasions and finishing on the podium in 2014. His challenge last year ended in a collision with Kimi Raikkonen, although Felipe Massa in the other car finished fourth. Williams has fallen behind Red Bull this season; the Renault power unit has improved enough to take the superior chassis and aerodynamics of the Red Bull ahead of Williams. Daniel Ricciardo and Daniil Kvyat are also driving well, especially the Australian, who has been very fast and consistent this year. Kvyat had a strong run to the podium in China, with a determined move on Ferrari's Sebastian Vettel at the start and indication of how determined the Russian is to retain his seat next year or at least to attract another top team to pick him up if Red Bull replaces him with Max Verstappen, as seems probable. Bottas has not had a great start to the season and so will want to make his mark this weekend. Qualifying will be absolutely crucial for his race effort, but the team will have to plan and execute aggressively against a top class strategy team at Red Bull. Ricciardo's ace up the sleeve is his ability to make the tyres last while maintaining strong pace. If Bottas and Massa get ahead of him, he can use a variety of tricks including the early undercut to put pressure on them. It will be hard for Williams to beat Red Bull this weekend, given perfect reliability on both sides. Strategy wise, the race will probably be less diverse from a strategy point of view than the three opening events as the track has very low tyre degradation and wear, so a set of soft tyres will last around 40 laps and that means fewer pit stops. Mercedes-Benz currently has a 100 per cent success rate at the Russian Grand Prix. Lewis Hamilton’s two wins in the first two races to be held at Sochi stand alongside Georgy Suvorin and Willy Scholl’s triumphs for Benz in the race in 1913 and 1914. Although it should be noted that the two twentieth century victories came before Benz was merged with Daimler in 1926. Mercedes also clinched the constructors’ championship at Sochi in both 2014 and 2015 – it cannot do so this weekend as the race has switched from its previous October slot on the calendar. Nico Rosberg heads to Sochi with the chance of equalling Michael Schumacher’s record of seven wins in a row for Ferrari from the 2004 season. But even if he does win this weekend, the championship leader would still be behind the overall record of nine wins in succession, which is jointly held by Alberto Ascari and Sebastian Vettel from the 1952-1953 and 2013 seasons respectively. Rosberg took pole and was leading in Sochi last year when a throttle problem caused him to fall behind Lewis Hamilton and then retire from the race. Speaking ahead of this year’s event, Rosberg explained he was looking forward to returning to Sochi, where he finished second in 2014 despite an early pitstop for new tyres that dropped him to the back of the pack. Hamilton has only led one lap so far in 2016 compared to the 119 he had notched up by this stage in 2015. But the world champion will equal Niki Lauda’s F1 start total of 171 races this weekend. The British driver has also never taken the title when he hasn’t won at least one of the first three races during his F1 career so far. Ferrari can claim its 700th podium finish if one of its drivers finishes on the podium this weekend in Sochi. The Italian team has scored 224 race wins, 248 second places and 227 thirds throughout its history in F1. McLaren is second on the all-time podium list with 485, but the British team has only added two rostrum visits to its total since the end of the 2012 season. After he recovered to finish second in China, Vettel is now tied with Raikkonen on 81 podiums, while at McLaren, Fernando Alonso’s 11 races without a top ten result matches the worst run of his F1 career. Alonso’s previous worst set of results came in his first 11 races for Minardi back in 2001. The Spaniard would not be on such a streak had he not been given a five-second time penalty after the 2015 Russian race for not respecting track limits, which dropped him from 10th to 11th in the final results. Max Verstappen is the only driver to finish every racing lap other than Rosberg, Hamilton and Daniel Ricciardo so far in 2016. The Dutchman also became the first ever Toro Rosso driver to score points in first three races of an F1 season after he finished eighth in Shanghai last time out. 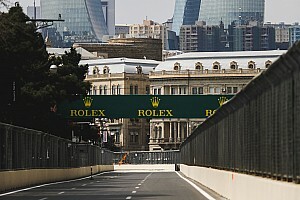 Are you looking forward to the Russian Grand Prix? Do you think Williams can continue its good form in Sochi? Leave your thoughts in the comment section below or head over to the JAonF1 Facebook page for more discussion.